To get a sense of the potential benefits of the Foundations program, we sent out a voluntary survey to participants before they began it and then many months later, letting us make “before” and “after” comparisons. The survey consisted of ten well-established psychological measures that are listed in the Table of Results below, and it was analyzed with standard statistical methods. In sum, participants reported significant improvements in every single area that we assessed. In particular, they described becoming more mindful, self-compassionate, satisfied with life, and grateful, with increased happiness, self-esteem, and sense of connection with others. They also reported less anxiety, loneliness, and depression. These improvements were not merely "statistically significant,” but in most cases had substantial “effect sizes.” There were large increases in mindfulness and self-compassion, medium-large increases in happiness and self-esteem, medium increases in satisfaction with life and medium decreases in depression and loneliness, and small-medium increases in gratitude and decreases in anxiety. 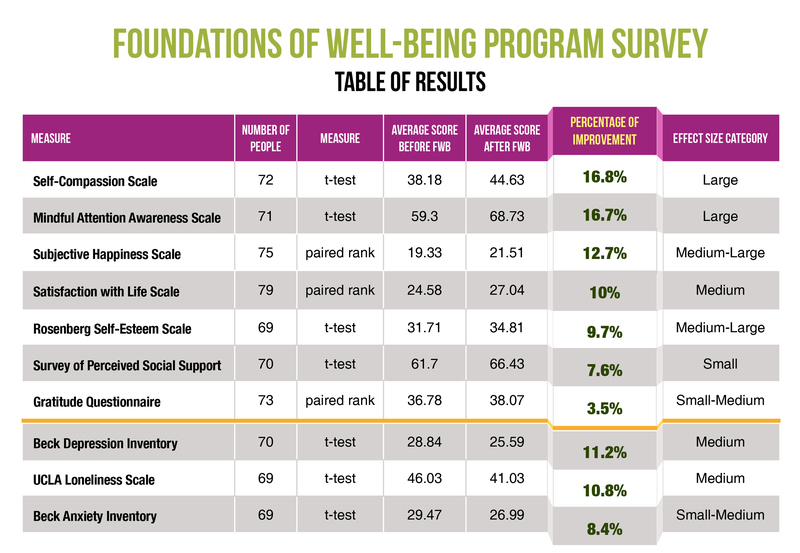 We are really pleased with these results, and very glad that the Foundations program can be helpful to people. SIGN UP FOR THE FOUNDATIONS PROGRAM NOW!